Anyone who has seen a Baby Taylor before will be familiar with the body of the Taylor Swift Signature – a 3/4-scale dreadnought shape which both looks cute and feels comfortable to hold. This model features an X-braced solid Sitka spruce top paired with laminated dark sapele back and sides, all matte finished. Most notably, the top sports intricate ‘Love, Love, Love’ vine artwork screen-printed around the soundhole, punctuated by Taylor’s signature just above the bridge. Joined at the 14th fret, there’s a tropical American mahogany neck, with a small hand-friendly 1-11/16” nut width, an ebony fretboard, and 19 frets with simple dot inlays. It’s put together in Taylor’s factory in Tecate, Mexico and shows superb craftsmanship, with a sleek and fun-to-play feel. This is a purely acoustic model, so no electronics to discuss, however it comes fixed with some solid hardware that makes it even more enjoyable to use. On the Taylor-branded headstock (that’s the brand, not the singer!) you’ll find six die-cast chrome tuners, which are responsive and smooth to use. Matching the fretboard is an ebony bridge, with a NuBone saddle and nut for a better performance than plastic, which is found on cheaper guitars. It comes strung with a light gauge set of Elixir’s NANOWEB coated strings and includes a good quality padded gig bag, which complements the look and provides a secure way of transporting your new baby. Things are shaping up quite nicely for this Baby Taylor and the sound doesn’t let it down. Of course, due to its compact size, the volume is a little quieter than what you’d get from a full-size guitar, but it still has a good voice. The tonewoods combine to give you a well-balanced sound with enough sparkle from the spruce and a warmer, woody tone from the sapele, which is similar in makeup to mahogany. Spending around $300 on a guitar for a child can be a bit of a risk – if they give up learning after a few days it could be an expensive mistake! 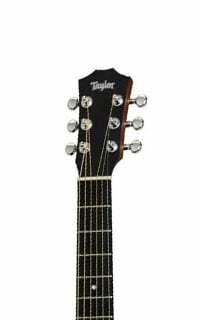 However, a model such as Taylor’s Taylor Swift Signature is both easier to play and better looking than some of the more entry-level kids guitars, and may be a good incentive for kids to practice and perform – who wouldn’t want to play on this beautiful little acoustic? With a sweet sound, lovely feel and a unique style, it also makes a pretty great travel guitar for adults – providing you’re a fan of Taylor Swift! For more info about the Taylor Taylor Swift Signature, click here.